Nothing I saw was this beautiful. But some things I saw along 66 I’ll never forget. Hello, all. This is my 72nd day on the road and I am in Dayton, Ohio, a city which is a dramatic story in itself but for a later time. I just looked at my odometer. I have driven 3,675 miles and I am finally in the Eastern Times Zone! So, I am getting closer. If I made a mad dash.I could make it home in two days. But I won’t do that. Still have places I want to see. And I’m still having fun. If I had taken Interstates all the way home in the most direct way, I’d be home by now and would have saved a lot of gas money. Yes, since the start, I’ve driven some short stretches on Interstates. Not because I prefer them. No, no, no. Only because it would be silly not to. Whenever it made sense, I’ve chosen state roads–secondary highways. Some four lanes, some two. All in mostly good condition. but some bumpy ones, too. But, believe me, what a relief not to be tailed by a parade of huge trucks, which all choose the Interstates. What a relief to cruise at a calm 50 or 55 rather than frantic 70 or 75. What a pleasure to again see occasional houses and people and little businesses and even small towns. It was a historic highway. Truly historic. Much of it is gone, yet I’ve traveled hundreds of miles on some of its remaining stretches. Some of it has been dull. But much of it wonderful and very worthwhile. Familiar with it? Old Route 66 is sometimes called the Mother Road. Sometimes called America’s Highway. As you may know, Route 66 has been celebrated, in fact immortalized, in countless books and movies and songs and videos. It’s as American as apple pie. It was our most famous highway in pre-Interstate Highway times. It remains an indelible part of our romantic past. It was built in the 1920s as our very first paved highway for its whole length–paved for automobiles, of course, which were the flivvers of those day. It was not a state highway. It was a U.S. highway. What a huge and important break-through that was. It was our longest highway by far, more than 2,000 miles in all. It connected Chicago on its eastern end and Santa Monica on the California coast at the other. Before it was created, no way could someone in a flivver attempt even a ride of 50 or 100 miles across that terrain…too many flats and break-downs. Let alone think of crossing two-thirds of the USA! Which Route 66 made i possible to do, and quite comfortably. It changed everything. Businesses boomed. Commerce took off between towns and cities and states. Markets opened up. People’s views of life and work and country expanded. We became bigger. For the first time really, people became Americans instead of just citizens of this town or that county or state. And a remarkable thing happened. All along Route 66 sprang up gas stations and restaurants and boarding houses and hotels–and then the newfangled motels. Route 66 was a two-lane road in the beginning, sometimes black-topped, sometimes concrete. What a pleasure it was to drive on a smooth surface, and with no fear of having to ford a little stream or break an axle on holes and ruts. Route 66 was impressively engineered with reasonable grades up and down. It offered solid bridges with no annoying planks to clatter when you crossed over. Astonishing road cuts in hills to make the going easier and safer. It was as significant for the dawning Automobile Age as the transcontinental railroad had been half a century earlier. Of course, Route 66 was imitated by other states for their highways. All built to similar high standards. And before long, all states agreed on common standards for their highways. Finally we had a system of highways making it possible to venture far and wide. What a feat! Then bad things happened for Route 66. President Ike Eisenhower came along and began pushing his idea of federal interstate highways. He said they were essential for our national defense, he said, and, of course, for our expanding economy. His Interstates would have even higher construction standards than Route 66 and the other state roads like it. The’d have understandable markings-be even-numbered for the stretches east and west, and odd-numbered for those north and south. And free! Well, except for a few exceptions such as the Massachusetts Turnpike, which charged tolls. It was my home state then. How Massachusetts and the others—Connecticut was one–got away with that, I don’t know. But! What happened is that Route 66 and its many imitators suddenly became painfully quiet. People flocked to the new Interstates. They loved whizzing along with no traffic lights. Loved the easy on and easy off. Loved traversing even large cities in mere minutes, or just skirting around them. What time-savers the Interstates were. And they made road shipments of goods of all kinds so much easier and faster—even faster than the railroads could do the job. But dire consequences, too. For one thing, countless communities shriveled up.” Out of Business” and “For Sale” signs began appearing. It was a death sentence for some communities. And for many others, a humbling one—few people stopped by any more. Some sections of the Interstates replaced sections of Route 66. In other places, the Interstates paralleled it. Route 66 became far less important. Fell into decline. So, after many years, Route 66 was “de-commissioned”! Route 66 is no longer a federal highway. How many times has that happened? Not many. Many sections still exist. I have ridden numerous sections of it. Now and then in deplorable condition—so bad I couldn’t wait to get off it. But in other sections, especially in creative-thinking communities, their sections of the old route were hailed for their promotional value for business in general, and especially tourism. I’m pleased to tell you Route 66 has been a wonderful treat for me especially in Oklahoma. I’ve traveled it happily for mile after mile. So enjoyable. Through many small towns, some with populations of only one or two thousand. I’ve stopped at small country stores to buy a few bananas or glance at local newspapers. Any excuse to poke around and stretch my legs. I’ve stopped to walk up and down a quaint main street. Explore antique shops and check thrift stores; what fun. Visit local libraries, of course—some tiny ones with just a room or two, and I’ve been welcomed at all of them. Yesterday I stopped to enjoy a flock of goats in a small pasture–white bodies with brown heads. So identical they seemed factory-made.. I stopped again this morning, this time to enjoy cows in a lush field. About30 or them. I’ve seen lots and lots of cows. These were different. Usually they’re all black or all brown or maybe all white. These were mixed, like us Americans!. I took out my camera. Hollered at them to get their attention. They ignored me. Hollered again. Only one or two looked up, but just for a second. Then they got a signal, I swear. They all turned their tail and started walking away from me. I felt insulted. And I had made a U-turn to come back and be friendly and say hello. How impolite. Things got different at the Oklahoma line. Crossing from Texas into Oklahoma was dramatic. It’s the right word. For many days I had been driving over vast stretches of geography often with nothing in sight. No houses, no ranches, no trees, no people, no animals except a bird now and then. Just a car whizzing by in the opposite direction once in a while. Several times I stopped to take a picture showing nothing on any side. Nothing. Just endless flat land! That’s a strange experience, believe me. The chane in Oklahoma was so fast. I began top see grass–green grass. And clumps of trees, small and then bigger. And even a little pond (wow!). Then groves of trees. Then a forest. Hey, it made me think of Connecticut. All in just a few miles! It’s as if somebody had drawn the Texas-Oklahoma state line right there because they were struck just as much as I was by the huge contrast. I’ve crossed practically the whole state on Route 66. Along the road I’ve noticed numerous historic markers about it. It’s surprising how many pamphlets about it I’ve picked up, and about things to see along it. I just remembered I should tell you this. It happened at the Motel 6 in Santa Few, New Mexico. I had put up there for a week when I got ill. I heard unusual noise in the parking lot at 8 a.m. I peered out. Many Harley Davidson motorcycles were parked out there. Unusual.Their riders were getting ready to take off. Men and women in their 40s and 50s in leather—leather helmets, boots, gloves, the works. The men sported beards and tattoos. The women huge earrings and tattoos. Quite a sight. He said something but I didn’t understand. His strange accent. He noticed. Repeated for me. “From the Czech Republic! 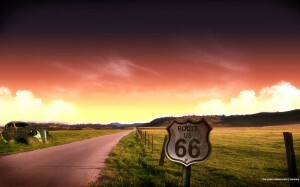 We are riding Route 66!” He smiled at the thought. A great adventure, obviously. He was so happy.Yes, riding Route 66 all the way. It would take them 21 days. They were packing their stuff into a big white van–their support van for the whole trip. In minutes, the lead driver gunned his throttle and they all started up. You should have heard the roar! And off they went. I went online to learn more. Companies offer motorcycle travel fans, and they advertise them here and abroad. A typical package includes the round-trip air fair, the rental bikes, the motel stays, the support van, and other basics. But there are many extra costs. Gasoline, and insurance, many meals, and fees at parks and museums and special amusements. That 21 days could build up to $10,000 per rider. Route 66 took me through huge Oklahoma City and only slightly smaller Tulsa. I arrived in both around 5:30 p.m. as planned. I wanted to arrive after most folks had gone home. Just to drive around slowly and savor the two cities. For years, Oklahoma City was a big cattle town and Tulsa a huge oil town. You can still see many signs of this history in them. They have a lot more going for them now. They are greatly diversified now, and you can tell they are prosperous. Most Midwest cities have common features and I saw that clearly in these two. Their streets are laid out in grid patterns. In New England our street patterns are so wild and crazy. And Midwest cities have wide streets and keep them very clean. So many of our cities back home do not. It seems a matter of pride for these cities. And these cities look fresh, safe, wholesome. Can’t say that about some of our cities. Both have big, tall buildings. But what big big city does not? Methinks it’s all about keeping up with the cities in your league. The way so many of us do our utmost to keep up with the Joneses. The tallest buildings are the newest, of course, and they feature lots of glass and aluminum and stainless steel. The big buildings of the previous generation are less tall, and they feature fancy masonry and concrete. They didn’t have today’s technology back then. It’s fun to speculate what the next generation of big buildings will look like. I’m sure architects are scratching their heads to come up with something different that will be bold and exciting. The temptation is to design buildings taller and taller . To me, such thinking is foolish. Those big buildings de-humanize us. Make us feel insignificant. And they’re dangerous. I wouldn’t want to work or live way in one of those monsters. As expected, both cities boast fine museums and shops and parks and restaurants. I would have given both more time and attention a few years back. I’m still interested, but it’s so hard so find parking spots now! Don’t giggle; I think you get my drift. In Oklahoma City, it was my Day 34. The sky was gray and threatening. Sure enough, I soon felt a few drops, but coming down faster. My very first rain in 34 days! It felt good. Then it came down hard and I was so glad I had packed an umbrella. Well, tornadoes hit the area, as you know, including a humongous one. It killed 25 men, women, and children or so in tiny Moore. Injured many, many more. Destroyed property in the multi millions of dollars. A huge calamity. Strangely, I was very close to all that. Just 10 miles or so away. I say strangely because I never saw any tornado. I was totally unaware this big one was raging.. Then I saw two police cars whiz by at 80 miles an hour, red lights and sirens on. I still didn’t know why. Very soon I got emails from family and friends worried about my safety. Some said they were praying for me. How wonderful. But that’s how I found out! It was a pleasure to send out word I was fine. Of course, the risk of so many tornadoes every year is scary. Oklahoma averages more than a hundred, more than any other state. It’s a big state and tornadoes hit usually just small areas, but still. I know that sales of pre-built steel Tornado Safety Closets are attracting buyers.They run $5,000 and up. People buy one for their basement and consider it a smart buy. And many people consider tornado insurance a must. Who thinks of such things in Connecticut? Of course, tornadoes could hit us, too. Imagine what even a small twister would do to little Deep River! More than once while driving through Oklahoma I thought of the awful Dust Bowl here in the mid-Thirties.That’s what they called that incredible disaster. Long periods of drought, poor agricultural techniques, and record-high temperatures–110 degrees and higher–led to the Dust Bowl–the topsoil got blown away! Massive crop failures. Bankruptcies. Countless families threw in the towel. Packed up what they could and headed west. Left Oklahoma and never looks back. An awful chapter in the state’s history. Another disaster like that seems ruled out because of numerous improvements, plus the fact modern agriculture is so much smarter. Meteorology is making great strides. Science has brought us so many wonders that we once thought impossible. Science will triumph again. The question is, when? Leaving Tulsa, I had to abandon Route 66. It was heading northeasterly. I had to head east, toward the northwest corner of Arkansas. I said goodbye to Route 66 with regret. My impression of Oklahoma all the way across is that it’s a great big beautiful lawn. And that Oklahomans are nice people. Well, I’m glad I favored Route 66 . I got a much better look along it and got to enjoy the ride so much. It’s wonderful that Route 66 is being remembered so fondly. If only we had done as much for our Route 1 from Maine to Key West, Florida! It was historic, too.